Table 1. The effect home field advantage has, in percent, by each individual statistic. 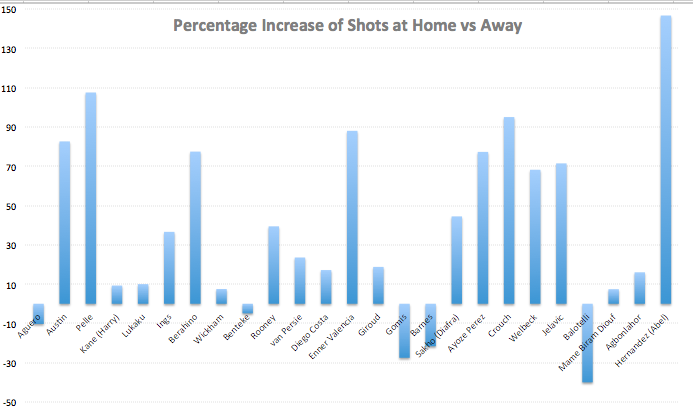 A 10% home advantage in shots signifies that a team averages 10% more shots at home compared to on the road. Stats used from the past two seasons of the English Premier League and the past NBA season. NBA stat shown for reference only. The table above shows some of the biggest stats used in DFS Soccer. As you can tell, there is a huge increase in the stats players earn at home than those they earn on the road. For reference, I’ve shown the biggest DFS scoring category in basketball, just to show how big of a difference this makes in soccer as compared to a more widely known American sport. The difference is exponential. We can go a step deeper and look at this on a team-by-team basis. Looking at the chart above, we see that all teams recorded more shots at home than on the road. That’s a big piece of information that we can use when building our lineups. 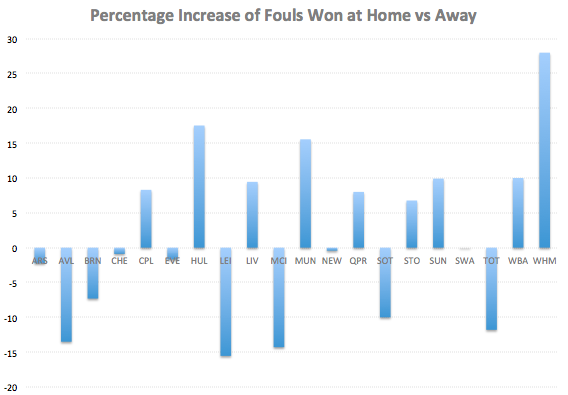 But looking a bit deeper, we see that some teams were much better at home than on the road. 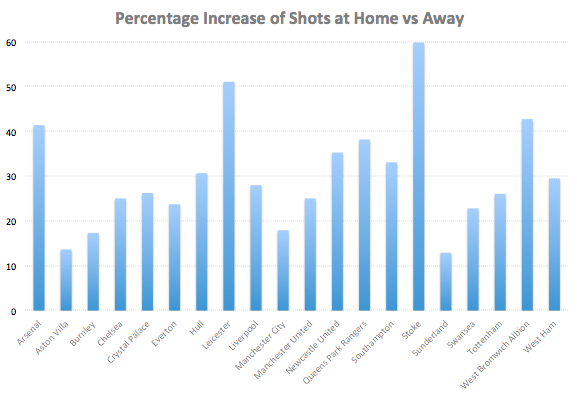 Stoke had a 60% higher shot rate at the Britannia Stadium, and that’s not that surprising considering that they’re known as a very good home team. Leicester City also played very well at home, while West Brom and Arsenal round out the top four. On the other end of the spectrum, Aston Villa were barely any better at home than on the road. That’s also not surprising, as Aston Villa were extremely poor last season and only had success when playing extremely defensive football. They were a decent counter-attacking team and would have relative success when other teams attacked them. They’d stay back, defend, and go out on the counter. The problem is that it is very difficult to do that when other teams don’t attack you. When Villa were at home and teams failed to push them, Villa looked lost – they didn’t have a midfielder who could keep possession and create. All of that led to a fairly poor performance at home across all stat categories. Look for Villa to have similar results this season, and don’t be surprised if Norwich and Watford join the club. 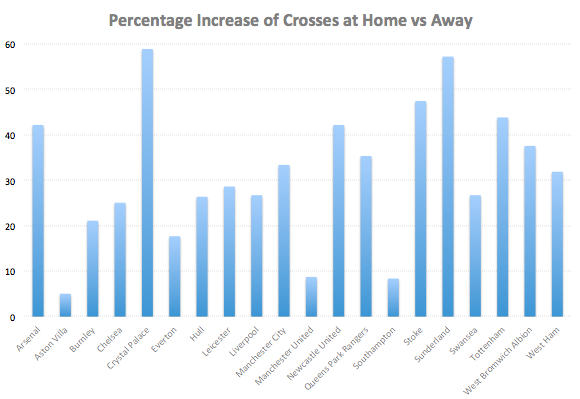 As with shots, we see a fairly similar distribution of crossing being better at home. The advantage is again significant, as 30% makes a big difference on a week-to-week basis. A few teams that stand out here are Crystal Palace and Sunderland. Sunderland is especially interesting because they had a much smaller home advantage in shots, leading us to believe they failed to produce on their high crossing opportunities on the road. Goals were a big hit or miss for a lot of these teams, and it’s hard to figure out why. It mainly comes down to the style of play fitting in with the team’s strengths and weaknesses, but that’s a much more complex topic we can dive into another time. To put it simply and give an example, a team that doesn’t have a good holding midfielder and a playmaker will have trouble playing possession football at home, and if other teams aren’t attacking them, they’ll struggle for opportunities to counter-attack, effectively making them a relatively better away team than a home team. Crystal Palace is a good example of that, as well as Aston Villa, who we talked about earlier. 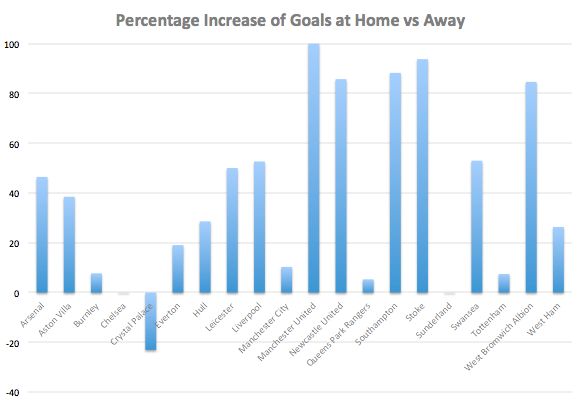 Palace was great on the counter-attack last season and actually scored more goals on the road than at home. Don’t expect them to be the same this season, as they’ve made some good signings that will improve their team in possession. To be quite honest, the majority of this looks like noise. The percentage difference is quite small for all teams and if this isn’t noise, it’s not significant enough to result in an affect big enough to be meaningful for fantasy purposes. Looking at these same numbers from a positional standpoint, there is not a huge difference in home advantage between positions, meaning that home field advantage mattered similarly for all positions. Observe the table below. Table 2. The table shows the home advantage (as a percent above away numbers), of a certain position’s statistic. For determining cross advantage, only players with greater than 30 crosses were considered, while for shots and shots on target, only players with greater than 20 shots were considered. The only big discrepancy is for defenders’ shots on target, but we can likely attribute that to a small sample size, as the number of defenders with shots greater than 20 isn’t big. I really expected to see quite a difference here between the positions, and I am quite surprised to see the similarities. We can also look at the data for each individual player. Some players simply play better at home, while others are greatly affected by their team’s style of play and experience different results at home versus on the road. The next step would be for us to check how consistent these trends are on a year-to-year basis, and I plan on exploring that piece in another article later this season. I hope you found this piece helpful. I think the main takeaway here is to see that home advantage is a really big deal, and once we have more data from this season, we can look at those numbers and try to extrapolate towards the end of the season. There will obviously be a difference from last year to this one amongst how individual teams perform, some due to new players coming in and some due to coaching changes. But above all, remember that home advantage is big for almost all teams, and use it to your advantage. Thoughts on the article? Tell Galin how you feel!